New research by astrophysicists focused on stars in the north part of the constellation Upper Scorpius roughly 470 light years from Earth, which is a part of the Scorpius-Centaurus OB association, one of our the studied groups of young stars and a benchmark sample for investigating the early lives of stars and the evolution of their planet-spawning disks. While those stars have been thought to be five million years old, the team concludes that those stars are actually more than twice as old, at 11 million years of age. The findings are surprising given Upper Scorpius's status as one of the best-studied samples of young stars in the sky. The wide field X-ray image of the Scorpius-Centaurus association above was constructed from the data of the ROSAT All Sky Survey Background maps. The yellow dots mark the positions of bright X-ray sources detected in the survey (only about 10% of the brightest X-ray sources are shown). The blue circles mark the three subgroups Upper Scorpius, Upper Centaurus-Lupus, and Lower Centaurus-Crux (from left to right). The scientists came to their conclusions after analyzing hundreds of optical spectra measured with the SMARTS 1.5-meter telescope at Cerro Tololo Inter-American Observatory (CTIO) in Chile, as well as reanalyzing previously published data on the stars. "We combined our new estimates for the temperatures of the stars based on our spectra, with data on the brightnesses and distances to estimate accurate luminosities," said Mark Pecaut of the University of Rochester. "Then we used state-of-the-art stellar evolution models to determine the ages." While similar methods were used in the past to calculate ages for some of the Upper Scorpius stars, Pecaut says no previous study has determined independent age estimates for members of the group over such a wide range of stellar masses. The new analysis shows that stars over a wide range of masses in Upper Scorpius – from slightly more massive than our Sun, up to the mass of the bright star Antares (17 times the mass of our Sun) are giving ages consistent with a mean age of 11 million years. "For one thing, the distances to the stars are now much more accurately known," said Pecaut. "Also, the newer computer models take into account the rotation of the stars and its effect on the mixing on the star's hydrogen – its nuclear fuel source." "The first criticism that we heard of the work was that our age estimates for the stars more massive than the Sun in Upper Scorpius disagreed drastically with previously published ages for the smaller stars in the group," said Mamajek. "However, we think the stellar parameters and models are on much firmer footing for the higher mass stars than for the lowest mass stars. The computer models of stars have trouble predicting the correct masses of low-mass stars when they are dynamically measureable, as well as the rate at which the low-mass stars consume their lithium through nuclear reactions. The situation is better for the high mass stars. So there is no reason to think that the ages for the smaller stars would be more accurate." In 2008, Canadian astronomers reported the discovery of the first imaged exoplanet orbiting a young Sun-like star —identified as 1RXS J160929.1-210524b. The object and its host star are members of the Upper Scorpius group. If the age of the star is much older than first thought, then the "exoplanet" has been cooling off for a longer period of time and consequently has a greater mass. In this case, the predicted mass of the object goes from roughly eight Jupiter masses to 14 Jupiter masses. Consequently, the object would not be considered an exoplanet by the discoverer's original definition, but a brown dwarf – a so-called "failed star." However there is considerable uncertainty about the origins of the low-mass companions discovered circling some stars on wide orbits at hundreds of astronomical units, so the jury is still out on the nature of objects like 1RXS J1609b. Pecaut says with more accurate estimates of the ages of stars, scientists can better understand how long it takes planets to form. For example, if 11-million-year-old stars do not have gas accreting around them, it means that gas-rich planets like Jupiter and Saturn would have to form in less than 11 million years. Pecaut expects that the findings of the Rochester team will encourage scientists to reassess the ages of other star clusters. If it's determined that other stellar populations are systematically older than originally believed, then it may mean that the conditions for forming gas giant planets like Jupiter around young stars may typically persist for millions of years longer than previously thought. "If a stellar group as well-studied as Upper Scorpius can be twice as old as previously believed, then all bets are off on the accuracy of the previously published ages for other similar groups of young stars," added Mamajek. 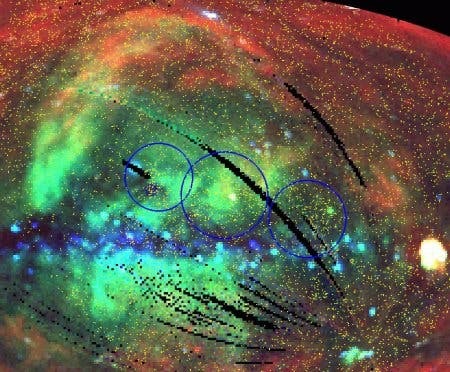 The findings by graduate student Mark Pecaut and Assistant Professor Eric Mamajek of the University of Rochester, and Assistant Professor Eric Bubar of Marymount University, were accepted for publication in the Astrophysical Journal.